At their own political peril? Supervisors Gordon, McGhee, Setliff, and Ward vote to approve a flawed Comp Plan Update – as a citizen, do you think the planning process was undemocratic? Submit changes at the last minute allowing no one, even yourself, to understand the impacts. Approve a quarry expansion that will threaten a historic battlefield and the North Anna River and use Comp Plan vote to avoid public hearing? Give your “planning partner” i.e., the citizens and Town of Ashland a few minutes to review the revisions before you vote, again allow NO time for rational studies to be conducted. As a county official, listen and adopt all suggestions presented by developers and other special interests and then, once the Plan is fixed, invite citizens to participate in a “planning charade” in noisy high school gyms. Conduct official county business in restaurants and restrooms, but don’t let county administrators forget the power of FOIA. Stack and reshuffle sign-up cards for citizen comment at public hearings to create the “appearance” of support. Hold public Comp Plan “work sessions” at inconvenient times, especially before holiday weekends or in noisy high school cafeterias. Remind county staff to argue and not listen to the very people that pay their salary. Conduct a Citizens Survey and ignore the results. Dismiss and disregard those that disagree with you, including your fellow Supervisors. Pretend the Town of Ashland doesn’t exist. With so much at stake and a plan so flawed, will YOUR Supervisor approve of this Comp Plan Update on Wednesday, March 28th? Please contact your Supervisor. Your presence on March 28th will speak volumes. At the March 21st public hearing, Michael Seigel, an expert hired on behalf of citizens concerned that fuzzy math and flawed logic was used to justify the radical expansion of the SSA was not permitted more than three minutes to present his findings. When CHF asked the County if Mr. Seigel could give a presentation of his facts and findings, Mr. Seigel was denied. Why would the County want to suppress Mr. Seigel’s findings? Here are exerpts from Mr. Seigel’s counter response to Clarion, the consultants paid to create the basis for the radical SSA expansion. Hanover County’s proposed Comprehensive Plan Update, and in particular its “Land Capacity and Demand” section (staff draft, 8/24/06) and the subsequent “Summary of Land Capacity Analysis and Preliminary Recommendations” (10/3/06) contain a number of critical errors and unfounded assumptions. Seven were specifically identified and discussed in the Draft version of this Review. In responding to the Draft, Clarion Associates (the county’s Comprehensive Plan consultant and originator of the above-referenced documents) does little to nothing to dispel the serious nature of these problems. In fact, Clarion offers no response whatsoever to four of the issues specifically identified and discussed in the Draft Review. These (and other) issues cause the Update to erroneously designate tens of thousands of acres for high-intensity development in excess of Hanover’s needs over the next two decades, and well beyond. The Update doubles its error term by designating an additional acre of land for intensive development for each acre it projects will actually be developed. Clarion’s recent memorandum fails to provide a single example of any other capacity analysis that defines ‘capacity’ as in the Summary document it prepared for Hanover. Nor does it offer a single example where it has recommended a Comprehensive Plan to designate double the amount of land projected to be developed over the long-term (e.g., 20 year) planning horizon. Notably lacking from Clarion/County’s response is a single example or citation in which Clarion (or a qualified researcher or firm) has previously defined ‘capacity’ consistent with the manner employed by Clarion in the Summary document. Clarion’s assertion that the Update is based on sound, correct, and appropriate best practices used repeatedly elsewhere is demonstrably false. Four recent capacity analyses prepared by Clarion Associates for other communities do not apply the capacity criteria applied in the Summary. 1 Rather, they employ the criteria applied in the earlier “Land Capacity and Demand” document. This document found Hanover to have existing capacity to accommodate 120 to 150 million square feet (msf) of nonresidential space, which represents existing capacity of 275 to 360 years at the assumed rate of job growth. Clarion conflates these 29 parcels as being the only land that is or will be available for non-residential development for the next 20 years. This ‘method’ has no validity whatsoever, does not represent ‘best practices’, and is virtually certain to have never been applied by Clarion in other capacity analyses. Clarion’s memorandum does not respond to or dispute four serious and substantive issues raised in the Draft Review. 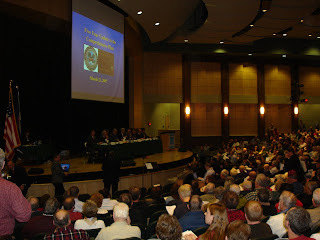 Last night, 1000+ Hanoverians packed the Hanover High School to express their overwhelming opposition to the proposed revision of the Comprehensive Land Use Plan! The Board of Supervisors have delayed their vote on the Comp PLan Update until the next week’s board meeting – Wednesday, March 28th. This vote needs to be delayed longer than a week! Please join CHF next week at the County Courthouse Complex – this plan still needs to be canned! More information from CHF forthcoming. Hundreds of residents turned out Wednesday night to discuss growth in Hanover County. The county is looking to open up a lot of farmland for urban development, but residents say county leaders are moving too fast. 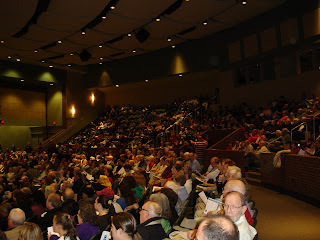 It was standing room only in an auditorium built to hold just over 900 people. About 40 people signed up to speak. Those who spoke in favor of the plan were booed. The proposal, backed by the planning commission, calls for designating 15,000 acres to become residential and commercial property in the next 20 years. Many want county leaders to rethink the plan and protect the rural landscape. One supervisor says growth is inevitable and the county needs to be prepared for future business parks. Some told the board that the county should solve existing problems with schools and roads before “dooming residents to sprawl,” as one woman put it. Residents say they’re not against growth, but they just want county leaders to be responsible about it. The board wants to first consider all of the public input from last night’s meeting before making a decision. It will vote on the county’s proposed comprehensive plan next Wednesday. Review Reveals Fundamental Flaws with Comp Plan! This report summarizes some of the serious problems and deficiencies found in a preliminary review of the “Land Capacity and Demand” (August 24, 2006), and the “Summary of Land Capacity Analysis and Preliminary Recommendations” (October 3, 2006) prepared in support of the Update of Hanover County’s Comprehensive Plan (“the Update”). This review was initiated by citizens of Hanover County, and was conducted over the last week. The review was not to be exhaustive or final. Rather, its purpose was to identify any significant issues or concerns related to the methodology and conclusions supporting the proposed Comprehensive Plan. After an informal presentation in Hanover, this written summary was prepared at the request of county staff for a meeting to discuss the initial results of this review. Accordingly, this review should be seen as a work in progress, and is subject to revision based on further research and review, input of county staff and their consultants, and as resources may become available. Hanover County’s proposed Comprehensive Plan Update, and in particular its “Land Capacity and Demand” section (staff draft, dated 8/24/06) and the subsequent “Summary of Land Capacity Analysis and Preliminary Recommendations” contain a number of critical errors and unfounded assumptions. These cause the Update to designate tens of thousands of acres for high intensity development in excess of Hanover’s needs over the next two decades, and well beyond. The Update doubles its error term by designating an additional acre of land for intensive development for each acre it projects will actually be developed. On its own, the “Summary of Land Capacity Analysis and Preliminary Recommendations” false representation of the current capacity of land designated for non-residential development invalidates its recommendations. But other substantial errors in the Update do so as well, of which some are briefly discussed below. However, the subsequent October 3, 2006 “Summary of Land Capacity Analysis and Preliminary Recommendations” (“the Summary”), estimates the County’s “non-residential capacity for development” to be only 14.5 msf.3 So how does the Summary document cause land with a capacity for 106 to 143 msf of non-residential space disappear? By pretending it doesn’t exist. The Update’s error is similar to confusing a single realtor’s current listings as being all of the property that might possibly become available on the market for the next 20 years. Or, it is analogous to confusing the total production capacity of the U.S. automotive industry over the next 20 years with how many cars are parked outside GM’s plants on a given day awaiting shipment. As demonstrated below, the county currently has sufficient land designated for non-residential development for, potentially, 275 to 360 years (2 percent average annual job growth at 400 sf per new job – which is 25 percent more than the average job in the county generates). Were, as the Update assumes, only half of this land to be developed, this represents ‘only’ a 140 to 180 year supply. The Update’s “Land Capacity and Demand” section does not make the above calculation, and anecdotally dismisses much of this land as being unsuitable for development. The Summary just pretends most of it doesn’t exist. Were the current supply of land designated for non-residential development to be unsuitable, the rate of job growth in the county should show a decline. Rather, it shows an increasing trend, from an average annual increase of 2.56 percent from 1995 to 2000, to 2.8 percent from 2000 to 2004. (Note, short term rates of job growth in growing communities typically exceed their long-term and outer-year growth rates). However, it would be typical for the county to experience a higher level of demand for larger-lot housing within and outside the SSA at this still early stage of its growth cycle. After all, Hanover is still largely rural to semi-rural, and many who choose to move to the county do so for that reason. This would account for why only about half the housing recently built in the county has been within the SSA, with the other half built outside its boundary – many of which take advantage of the county’s relatively low 10-acre minimum lot size requirement. But this can be expected to change in the outer years when the supply of developable residential land becomes less abundant, the county becomes more suburban/urbanized, and the price of land increases. This is characteristic of other suburbanizing jurisdictions in the Richmond region (e.g., Chesterfield and Henrico) and elsewhere in Virginia. For example, as the demand (and price) of housing in Loudoun, Prince William and Fairfax counties increased over the course of their growth cycles (during which they became increasingly urbanized), new housing shifted toward smaller lots with a higher percentage of townhouses, condominiums and apartments. The same dynamic is virtually certain to occur in Hanover, though its relatively slower growth rate (in comparison to high-growth Northern Virginia) will cause it to occur over a longer period of time. If it chose, Hanover could accelerate this shift by requiring rural clustering and/or by increasing its minimum rural lot size from 10 to 15 or 20 acres. The preceding discussion has focused on the supply side. But the Update’s treatment of the supply side is also highly problematic. This error causes the Update to mis-state the current jobs-to-workforce ratio as .8 : 1.0, when in fact, it stands at about 1.02 : 1.00. To achieve and maintain a ratio Hanover has already met and surpassed, the Update designates as much land as it estimates is required to accommodate 15,500 (34,000 less 18,500 = 15,500) new jobs.8 But more than half (8,200) of these jobs already exist and will not require any significant additional space or land. These 8,200 already existing jobs amount to between 21 percent (mid-range ‘high’) to 47 percent (VEC ‘low’) of the new jobs the Update considers to be ‘a likely future for the local economy’. Accordingly, and before adjusting for any other errors or problems, the amount of new non-residential land the Update determines to be required is off by roughly this same amount.9 And, because the number of new housing units in the county is linked to the number of new jobs, this error spills over into the Update’s assessment of the amount of new land needed for intensive residential development. The magnitude of this error is then doubled as the Update designates one additional acre for each acre it anticipates will actually be developed. The Update’s projection of the number of jobs, population and housing it expects to occur in Hanover do not appear to have been adjusted to reflect Ashland’s share of this growth. This causes the Update to designate additional land elsewhere in the county to accommodate jobs, population and housing that will locate within the Town of Ashland. The Richmond Regional Planning District Commission’s (RRPDC, Final Draft) 2031 projections allocate 3,460 of Hanover’s new job growth to Ashland.10 This represent between 7 percent (target trend ‘high’) to 19 percent (VEC ‘low’) of the new jobs the Update provides for. A similar error appears to have been made on the residential side where 3,187 persons RRPDC allocates to Ashland are included in the Update’s estimate of population (and households) that will occur outside Ashland. Again, the Update’s assumption that one extra acre should be allocated for intensive development for each acre it projects will be developed doubles the magnitude of this error. The Update’s non-residential demand forecast lacks a connection to regional market data. Rather than using market data to estimate Hanover’s absorption of such space, it merely assumes that Hanover will absorb whatever share of the region’s new development it estimates. It is not surprising then that this ‘if we project it, it will come” method conflicts with recent market data. The Richmond region is reported to have had direct absorption of .767 msf of office, retail and flex space in 2006 (absorption of industrial space was a negative 1.4 msf). But the update projects Hanover to absorb an average of .621, .971, .782, or 1.17 msf (respectively, mid-range low, mid-range high, target trend low, and target trend high) each year for the next 20 years. The Update foresees the VEC and mid-range ‘trend’ job and square footage projections in Table 7 of its “Land Capacity and Demand” section as representing a ‘likely’ future for the local economy. The square footage projections indicate the average new job in the county to generate between 495 to 550 sf of new commercial space. This compares to a current average of about 320 sf per job (17.4 msf divided by 54,700 civilian jobs, BEA 2005 est.) By way of comparison, newer flex space jobs generally range between 350 sf up to about 500 sf. per job, big box and discount retail jobs range from about 450 to 650 sf, while jobs in newer office space generally range between about 200 – 250 sf per job. The substantially higher figure applied in the Update reflects its expectation that a large majority of new jobs will be in the big-box and/or discount retail, warehousing, distribution, amusement, storage, and/or distribution sectors. Accordingly, the Update does not represent a balance of new jobs within the county, but (on average) a concentration of such jobs in lower-wage, lower value-added sectors. Were the Update to be based on a more balanced distribution of new jobs (though still largely in the sectors noted above) such that the average new job generated only 400 sf (25 percent more than the existing job in the county), its projection for the amount of additional land to be designated for non-residential development would be reduced by about 20 to 30 percent. Although there may be a need to make some adjustments within or at the margins of the SSA’s boundary, the Update does not offer a valid justification for a vast expansion of the SSA’s boundaries at this time. Overall, were the Update’s errors and other shortcomings to be corrected, and applying a reasonable market-based estimate of the county’s non-residential absorption rates, a balance of new job growth, and accounting for Ashland’s share of new jobs and population, there would be little need to expand the current boundaries of its SSA. Rather, the county’s 20+ year growth and development-related needs could be well met by some internal adjustments within the SSA, and possibly some (comparatively) modest incremental adjustments at its margins where opportunities for office and other higher value and higher wage jobs exist. Should future market, growth, or other conditions warrant, further adjustments can be made in subsequent updates to the Comprehensive Plan. Were the Update’s vision to be realized, rather than creating a balance of new jobs, it would likely result in a predominance of jobs among lower-value big-box and/or discount retail, amusement, distribution, warehouse, and storage space. Mr. Siegel has 30 years of experience in the field of public and environmental finance, development and land use impact analysis. He has been the Principal of Washington, DC-based Public and Environmental Finance Associates, llc., since 1992. His clients have included local governments, state agencies, economic development authorities, local utilities, airport authorities, Federal agencies, landowners, developers, business owners, environmental, and citizen groups. Prior to forming his own consultancy, Mr. Siegel held positions as a regional impact planner, public finance economist, research and budget analyst. He also served as the Director of the Office of Commercial Revitalization for the State of Maryland, and the Assistant Director of the Research Center of the Government Finance Officer’s Association (GFOA). Much of Mr. Siegel’s professional experience has involved development impact analysis in high-growth communities in Colorado, Wyoming, Washington, Oregon, Florida, Maryland, Virginia, and the U.S. Virgin Islands. The following are proposed changes to Hanover’s Thoroughfare Plan, is this your VISION for Hanover County? 1. Reclassify Hickory Hill Rd. (Rt. 646) between Washington Highway (U.S. Rt. 1) and Old Ridge Rd. (State Route 738) from Minor Collector (60’ ROW) to Major Arterial (120’ ROW). 2. Reclassify Ashland Rd. (Rt. 623) between Mountain Rd. (Rt. 33) and the Goochland County line from Minor Arterial (100’ ROW) to Major Arterial (120’ ROW) and add a Scenic Road designation. 3. Reclassify Cauthorne Rd. (Rt. 624) from Major Collector (100’ ROW) to Minor Arterial (100’ ROW). 4. Reclassify Cedar Lane (State Route 623) between Old Washington Hwy (Rt. 626) to Blanton Rd. (Rt. 666) from Minor Collector (60’ ROW) to Major Collector (100’ ROW). 5. Reclassify Elmont Rd. (Rt. 626) between W. Patrick Henry Rd. (Rt. 54) and Willow Farm Drive (private) from Minor Collector (60’ ROW) to Major Collector (100’ ROW). 7. Reclassify Cross Corner Rd. (State Route 641) between North Washington Hwy (U.S. Rt. 1) and River Land Hills Rd. (private) from Minor Collector (60’ ROW) to Major Collector (100’ ROW). 8. Reclassify Blanton Rd. (Rt. 666) between W. Patrick Henry Rd. (Rt. 54) and Ashcake Rd. (Rt. 657) from Minor Collector (60’ ROW) to Major Collector (100’ ROW). 9. Reclassify Blunts Bridge Rd. (Rt. 667) between Blunts Rd. (Rt. 716) and the Town of Ashland from a Local Road (50’ ROW) to a Minor Collector (60’ ROW). NEW ROAD THROUGH YOUR LIVINGROOM? 1. Proposed U.S. Rt. 301 BYPASS east of the Hanover Courthouse complex as a Major Arterial (120’ ROW). 2. Proposed interchange in an area between Hickory Hill Rd. (State Route 646) and Old Ridge Road (Rt. 738) at I-95. 3. Proposed intersection improvements at E. Patrick Henry Rd. (Rt. 54), Woodside Lane and Providence Church Road (Rt. 662). 4. Proposed Major Collector (100’ ROW) between Washington Hwy (U.S. Rt. 1, north of Jamestown Rd.) and Hickory Hill Rd. (Rt. 646). 5. Proposed Major Collector (100’ ROW) between Hickory Hill Rd. (Rt. 646) and E. Patrick Henry Rd. (Rt. 54). 6. Proposed Major Collector (100’ ROW) between Washington Hwy. (U.S. Route 1), at Lakeridge Pkwy, and Cauthorne Rd. (Rt. 624). 7. Proposed Major Collector (100’ ROW) on an extension of Verdon Rd. (State Route 684) east of I-95. 8. Proposed Major Collector (100’ ROW) from the proposed extension of Verdon Rd. (State Route 684) to Kings Dominion Blvd. (Rt. 30). 9. Proposed Major Collector (100’ ROW) between Cross Corner Rd. (Rt. 641) at River Land Hills Rd. (private) and W. Patrick Henry Rd. (Rt. 54) at Blanton Rd. (Rt. 666). 10. Proposed extension of the Minor Collector (60’ ROW) of Winns Church Rd. (State Route 660) west of Mountain Rd. (U.S. Rt. 33). 11. Proposed Minor Collector (60’ ROW) from Washington Hwy. (U.S. Route 1), north of Doswell, to the eastern side of I-95. Are You a Citizen EXTRA? Based upon whimsical illusions of “participatory democracy,” this final flawed performance will feature uninspired acting and monologues based upon erroneous planning data. Although the script has been hailed as a “guide for managing growth,” don’t be fooled. This is an Economic Development Plan disguised as a Comprehensive Plan. Revisions trotted out, once again, on Wednesday night will accelerate growth, intensify development, increase traffic congestion, and LOWER the quality of life in Hanover County. Common sense growth is all that we have asked for! Crafted by out-of-state consultants, real estate developers, county planners, and the Economic Development Authority – this final production will include MAJOR audience participation! In fact, the more you, CITIZEN EXTRA participate, the better! When you attend this “not to be missed” performance, bring your own costume, signs, and please remember, your stage time to voice opposition or support will last 180 seconds! Whether you express outrage, delight, or moo like an angry cow over the county’s desire to degrade the rural and semi-rural quality of life in Hanover County, please feel free to express yourself. As a CITIZEN EXTRA, you may experience moments of ‘deja vu’ in terms of the evening’s plot, but perhaps there will be a surprise ending? Arrive early and plan to leave late! The future of the County is at stake!